IT IS EARLY SPRING at the beginning of the fifteenth century. Along an english country lane, the people of the village are walking to church. It could be a Sunday, although Mass by no means is said only on sundays; there are frequent daily Masses, especially in large and wealthy churches with many priests. It could be the feast day of a saint. There is no end of celebrations to draw people to the church. The villagers greet each other, exchange small talk, wander on, and listen for the sound of the church bell. They are going to church to hear, to taste, to smell, and most especially, most crucially, to see. Walking into the church, dipping fingertips in the holy water font, the worshipers look up to see stained glass windows depicting scenes from the Old testament and from the lives of Jesus, Mary, and the saints. On the walls are paintings, sculptures, tapestries, frescoes, and mosaics. sacred objects such as woodcarved nativity scenes or a wooden donkey for palm sunday sit on the floor or on small tables or stools. though they are made of plain wood or marble, they are painted with vivid colors. The scent of incense and burning candles pervades the church. Quite likely, those entering the church have made some contribution to these decora tions. Guilds gave money to endow statues and artwork; local craftsmen sculpted and painted; women in the church sewed and embroidered vestments, altar cloths, tapestries, and drapings and veils for statues. At the crux: Jesus and his saints at the center of everything, firmly attached to the back wall of the church, is the high altar. Most likely, a saint is buried beneath it; most certainly, relics are stored inside it. The smaller the church, the more likely the average person is to be able to see the high altar fully. Larger and wealthier churches, and those with a great number of monks or secular priests attached to them and worshiping in the choir space, often erected rood screens between the people’s space and the choir and altar space. These were elaborately carved wooden barriers, solid from the waist down and full of windows from the waist up, with images of saints and biblical figures carved on them, and a giant crucifix in the middle. (Rood is an Old english word for the cross, and the screens got this name from their central crucifix.) Rood screens were, as historian eamon Duffy has remarked, both “a barrier and no barrier.” While they screened the activity at the high altar from the laity, sometimes the activity spilled out to meet the laity as the gospel book, holy water, or (on easter) the eucharistic elements themselves were carried out into the nave by the priests and deacons. at other occasions, such as Candlemas, the feast day honoring the presentation of Jesus in the temple, the people processed with candles through the door of the rood screen and into the altar space. Many screens had “elevation squints”—eyeholes cut into them at convenient places to allow the people to see the high altar and priests at different altars to see each other. though sunday Mass would be said at the high altar, the average weekday Mass was just as likely to be performed at one of the innumerable side chapels and altars that crowded the nooks and niches of the wealthier churches—or in front of the rood screen† where altars were often installed for the purpose. And, of course, even on sunday, people moved around to get a better view because there were no—or at least very few—pews; Karant-Nunn comments that in this era, “only princes, city counselors, and other august personages had pews.” they would not become widespread for several more centuries. Still, she notes that certain standing places became customary for certain people, with the poor standing closer to the back. Women and elderly or ill men might bring their own collapsible stools and set them up in convenient places. The action shifts from Word to Table and so the people watch. In essence, the form of the service is not all that different from the one we visited in the eighth century (see “Worship in the [supposed] ‘Dark ages,’” p. 26), although, if this is a relatively simple country church, it occurs with far less pomp and ceremony. there is a processional, a greeting, the confession of sin, the gloria, prayers, and readings for the day from the epistle and gospel. If the priest is literate, he preaches, not in latin but in the language of the congregation. then the action shifts from Word to table, with the creed, the offering, the priest’s washing of his hands in preparation for the Holy Meal, and the long eucharistic prayer, with its prayers for the living and the dead. the acolytes† swing a thurible (a large metal container on a chain), and incense fills the space around the altar. The priest faces the altar, not the people, and the prayers for the most part are silent. A bell is rung when the words of consecration are said so that, wherever they are in the church, the people will know that the holy moment has arrived—the moment for which many people come in fact daily to church. now the priest, facing the altar and beyond it (figuratively) the east of morning and resurrection, takes the sacred Host into his hands and raises it high so that all may see the body of the lord. Most people receive the bread (rarely the wine) into their mouths only yearly, at easter, after confessing their sins to a priest during Holy Week. 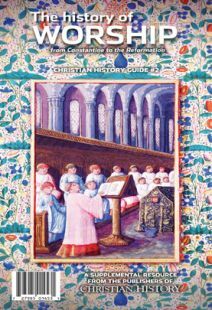 this annual ritual was often referred to as “taking one’s rights.” there were certainly those who received more frequently— fifteenth-century mystic Margery Kempe (see p. 52) was well known for receiving the Eucharist weekly—but most of the faithful tasted the body of the lord only at Easter. However, each week—even every day— they can see the eucharistic meal take place, and the devout hunger to do so. the people hold up their hands and recite their prayers. For a moment, they are of one mind and one spirit. everything else falls away. Those who have been to confession during the week before are allowed to come forward (often pushing and jostling each other) to receive the elements. Once the select few have been served, the communion vessels are cleaned, the lord’s prayer said, and the kiss of peace shared. In the Middle ages, the passing of this kiss didn’t involve actual kissing. Instead, a pax board was held between the attendees, and each person kissed one side of the board. The Mass closes with prayers and a dismissal. the priest, deacons, and acolytes process out of the church, and the Mass comes to an end. Slowly, the faithful file out again into the sunlight and travel home along the lane. But soon again they will return. They will come for the next Mass. They will arrive in a torch-lit procession—or quietly, on their own—to adore the consecrated Host as it sits in its monstrance, a large and ornate container, on the altar. Or, when services are not occurring, they’ll come with members of their guild to repair that window that needs fixing or paint that statue that really could use it or tighten that floorboard that creaks. Or they’ll come with other women of the parish, because didn’t you notice that one of the altar cloths has a hole in it? Or they’ll come to make sure fresh candles are burning in front of the paintings and statues. In short, they’ll come to maintain the house of the Lord and to meet him there. summer will come, and autumn, and winter, and year will turn to year and decade to decade. What did “sacrament” mean to medieval Christians? And how many were there? What sorts of music did worshipers use?